Best I can gather, the Living-Conditioned Homes program was put together as a collaboration between the magazine LIVING for Young Homemakers and either GE / Hotpoint or Westinghouse. Living-Conditioned was a manifesto by the magazine which embarked to design, equip and furnish homes that conditioned. The ... "Living-Conditioned" home embodies the principles of Living-Conditioning, and summarizes the advantages of sound-conditioning -- the acoustical planning to reduce unwanted noise; of light-conditioning -- illumination for visual comfort and beauty, carefully studied to apply to the house the benefits of electrical progress; of safety-conditioning; of climate conditioning; of color-conditioning, a coordinated interior and exterior decoration plan which makes the home visually and psychologically more pleasing. Later on in the program, LIVING had the architectural firm of Palmer & Krisel AIA design perhaps LIVING's most notable group of these type homes in Northridge, California. A wonderful brochure from Northridge is viewable here. 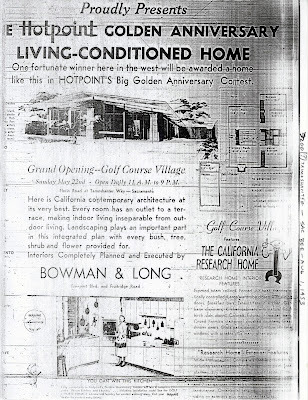 While the Northridge "Living Conditioned" homes were a complete tract development, early on the program attempted to have builders construct one of four commissioned plans (each regionally specific) in almost every state in the US. 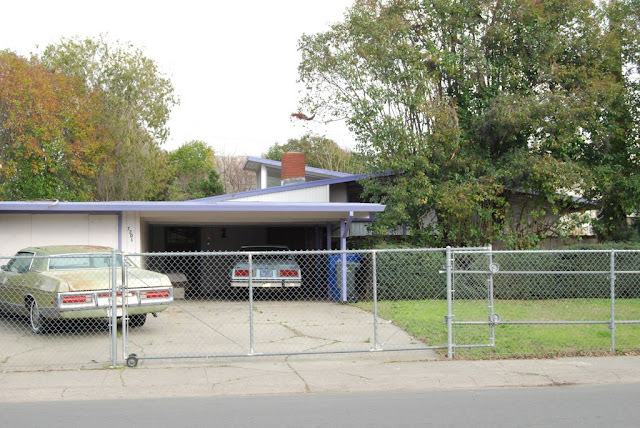 Around 1953, one of the plans designed by San Francisco architect Don Emmons (Frederick's brother) was built as a model home in the Meadowview area of Sacramento. Touted as "The California Research Home", the home features "every room [opening] to a terrace, making indoor living inseparable from outdoor living". The plan even provided for integrated landscaping with "every bush, tree, shrub and flower provided for." Interiors "completely planned and executed by Bowman and Long"
Today, the home doesn't look too appealing sited on main thoroughfare in a sultry area of town. Enclosed by a chain link fence around the perimeter and a multi-story strip mall facade to the back, it feels like looking at an exquisite, exotic animal, caged. But perhaps with the "Living Conditioned" ethos, once inside, it still functions as it was designed. Special thanks to sparklegem & Perks of the Lottaliving forum for scans of the Northridge brochure & Joe Barthow for additional pointers. Welcome to Modern Valley - Post + Beam Type Homes in the Sacramento Valley. This is a running record of cool homes, neighborhoods and things in the area. Images of homes for sale are most-often from real estate listing sites, and are assumed to be public domain in that context. Please contact us in the event there is a misunderstanding and they will be removed.